The property is a charming free-standing 18th century small house with a south facing terrace and it's own private 100m² garden. It is situated in the extensive and secluded grounds of the owner's principal residence which was built for King Louis' head groom of the stables at Versailles. The accommodation covers 40m² and comprises a living room and fully fitted kitchen downstairs, with a double bedroom and en-suite bathroom upstairs, and has south and west-facing windows looking out over the main grounds. Electric heating (radiators and water) is included, as are telephone (excluding calls to cell phones) and high-speed Internet access. The village of St Nom la Breteche has its own supermarkets, boulangeries, restaurants, chemist, banks, post office and tennis courts. Main line trains to Paris (St Lazare in the North or Montparnasse in the South) are close by. The area is well known for it's connections with artists, especially the Impressionists, including Renoir and Monet. Auvers sur Oise, where Van Gogh produced most of his paintings under the treatment of Dr Gachet, is within 20 mins drive. Giverny, Monet's home and gardens are 45 mins drive and Barbizon is 1hr away. Debussy's birthplace and museum are in nearby St Germain en Laye, easily reached in 20 mins. The chateau was the home of the exiled Stuarts from 1688 until the Revolution. There are many other chateaus of interest nearby such as Versailles, 20 mins by car, Maison Laffitte, Maintenon, Fontainebleau and Vaux le Viscomte. Further afield - but great for a day trip - are the Somme battlefields, the Armistice Clearing at Compiegne, Normandy and the coastal towns of Honfleur, Deauville, Etretat, the Somme Bay and estuary and it's extensive bird reserve plus the historic walled towns of St Valery and Montreuil sur Mer. For the sporty there are three golf courses within 5 minutes drive, including the world-renowned St Nom la Breteche course. Also there are tennis courts opposite and numerous paths and cycle tracks in the local forest. The famous racecourses of Longchamps and Chantilly are both not far. The bathroom is light and airy with a window overlooking the garden. It has been newly fitted and is spacious. The little red house sits amongst beautiful gardens, just a stones throw to the main house where our hosts Steve and Sue call home. The home is equipped for a short or extended stay, with full kitchen (cooktop, oven, microwave and dishwasher), dining table and sofa downstairs, bedroom and bath upstairs. A small table and chairs is outside for enjoying your coffee and enjoying the fresh air. A market, pizzeria, crepery and Asian restaurant are all within walking distance (or very short drive). There is an ATM directly across the street and a coffee house / bar less than 1 block away. It was a pleasure waking to the nearby church bells and sound of birds in the garden. Within a few mile drive are several golf courses (we ate at the local 9 hole course and the meal was exceptional). If ever in this area again we would definitely stay. Our hosts were always available by text, or a knock on the door. We were treated like friends rather than renters. The parking is behind a gate and everything is very secure. Thank you! We thoroughly enjoyed having you to stay and hope that you come back again soon! 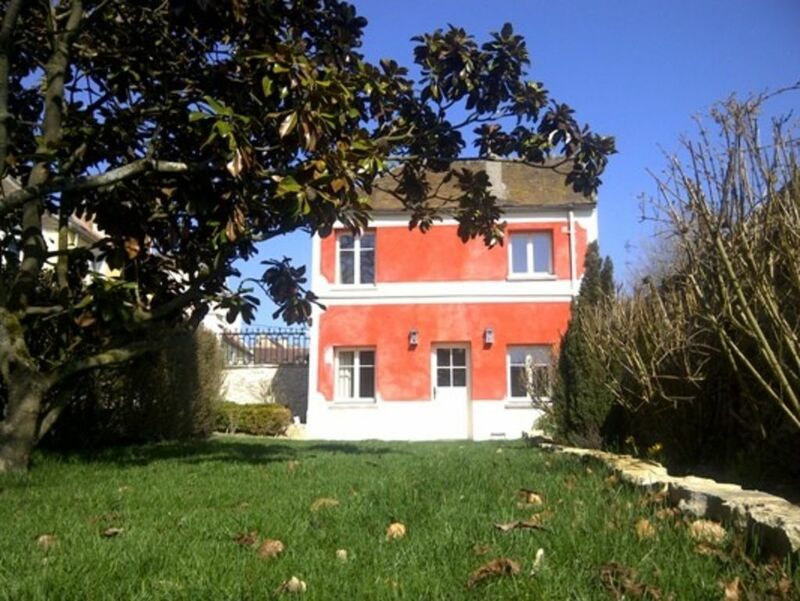 If you like functional house with a lot of charm, and safe parking and good internet and wonderful owner, not far from Versailles, this is the place to go! This is a great property to use as a base for visting various tourist sites. From here my wife and I visited Monet's house and gardens at Giverny, Chateau Fontainebleau, Versailles which is about 15mins by car. Central Paris by local train station with free parking approx 40min ride. There is a great little boulangerie within walking distance with amazing bread and pastries. There also two small supermarkets and resturants again within easy walking distance. The house has everything you could wish for, clean and comfortable and is in such a quiet and peacefull setting. Steve and Sue Knight - the owners are great and made us feel very welcome and were very knowledgeable about the area which came in handy. Thank you for the lovely accomodation and your help during our stay. Hope the wedding went well! Thank you for your review. We love meeting new people and when they're as charming as you guys it's easy for us to make them feel welcome ! We stayed here 6 nights and were sad to leave. This location was perfect for visiting Giverny, Versailles, Chartres and Auvers-sur-Oise. The owners were excellent hosts, providing information in English and French, they are both very gracious, welcoming and willing to assist when needed. The house had everything we needed, excellent appliances and comfortable bed. It was clean and quiet. We had an auto and there is parking on the property. Wifi worked throughout the house. The town of St Nom had everything you need, with an assortment of restaurants if you don't feel like cooking, but many shops for the meals you may want to eat in. We would happily return to this property and stay longer. We stayed here for 9 nights and enjoyed our holiday a lot. We chose it as we wanted to visit Paris, Versailles, Chartres, Giverny and it proved ideal. We had lots of communication with the owners before arrival, and there was plenty of local info at the house. It was clean, well equipped, quiet, private and a pleasure to come back to after a day out and sit in the garden sipping wine and eating cheese. Being able to get the local train to Paris from the local station (in the forest, so no parking problems) was a winner for us. After a day in Paris i used the bath as a private spa. Birds sing in the morning, French speaking Green-yellow-red Woodpeckers mate! Fresh fish, fruits, quiche and Italian quizine but a 10 minute walk. Accupuncture, dentist, optimologist, facials, beautition, bookstore, post office, bus service, woods walks, rough bike trails! lots to do. Shopping for anything....two Malls 20 minutes drive, historic sites. Never board assuridly.